MASTER PROBLEMS Emotions and Personality How to deal with road rage? What prompts road rage? If you are a victim, what can you do to protect yourself? If someone else’s driving makes you angry, what should you do? Indeed, as road rage proliferates worldwide, how can you cope? Angry drivers are nothing new. One early offender was English poet Lord Byron. In 1817 he wrote a letter in which he related a dispute he had on the road. Reportedly, another road user was “imprudent” to Byron’s horse. As a result, the poet boxed the other man’s ears. Although not a legal concept, road rage aptly describes the emotions at the root of many a violent act committed by motorists who are provoked by the other driver’s manner of driving. No matter how wildly a driver manipulates his vehicle, he feels justified. But when another driver commits a minor infringement of road courtesy, road rage flares. The growing drug culture, so widespread among young people, also contributes to road rage. Drivers who take drugs often have an exaggerated view of their own abilities. As a result, some drive their vehicles at dangerous speeds. Others drive erratically, their judgment impaired. Consider, too, the effect stress has on a driver. Professor Cary Cooper of Manchester University blames the stresses and uncertainties of daily life for much of the road rage. “Drivers are becoming more stressed and the number of violent assaults is increasing,” says a Royal Automobile Club spokesman. One busy public relations executive who now spends long hours driving to and from work admits that she is not as tolerant as she used to be. “Now I am quick to snap and get cross over little things that would never bother me before,” The Sunday Times reports. Perhaps you feel the same way. If so, what can you do? How to prevent road rage? Recognize that other drivers are not perfect. They will, on occasion, break the rules. Make allowance for this in your driving. Think ahead. For example, you may drive in the nearside, or slow lane, of a multi-lane highway. But then you approach a junction where a slip-road, or entrance ramp, filters traffic in to join the highway. Looking ahead, you see a car approaching the highway along the slip-road. Do you reason that you were there first, that you have a right to drive in your lane? Why should you give way to the merging traffic? Why should you steer into another lane, if clear, to allow the other driver to get onto the highway? But think, what will happen if you insist on holding to your lane and maintaining your speed? Perhaps the driver joining the highway will think similarly. Inevitably, someone must give way; otherwise, disaster will strike. Wisely, the driver who wishes to avoid provoking road rage looks ahead and drives considerately. He gives way when he can, and he does not become angry when the other driver fails to acknowledge the courtesy shown him. A representative of Britain’s Institute of Advanced Motorists estimates that 1 out of every 3 drivers has a dangerous attitude problem. Most drivers at times ignore other road users. But that does not justify your acting that way. Consider possible consequences. Surely you do not want any stubbornness on your part to provoke a pileup. Do not let your emotions take over. A driving expert advises: “You must never react or respond to aggression on the road.” Refuse to join the road-rage club! 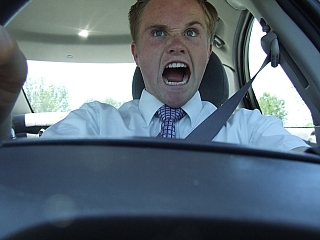 Virtually every driver has at some time been the victim of road rage. The raised fist, the shouted abuse, the aggressive maneuvers all can and do frighten. The best protection is surely to avoid conflict. One victim felt intimidated when a fellow driver wanted to get ahead of him. Finally, the angry driver overtook him, cut in, and slowed down so much that the victim feared that their cars would crash. This continued for some distance and ended only when the victim turned off onto another route. If you see that other drivers want to get ahead of you, do your best to let them. Avoid insisting on your right to be where you are on the road. If you have knowingly irritated others, apologize. Gesture to indicate that you are sorry for even unwittingly causing offense. Remember that a mild word can defuse rage. But if, for whatever reason, you are the victim of a road rage attack, don't retaliate. Other tips: Keep your car doors locked and windows shut. Avoid eye contact with an aggressor. Do your passengers observe your anger? Perhaps they suggest that you calm down. Don't simply brush away their advice and retort that they are back seat drivers. Remember, a calm attitude is more healthy and may literally help you live longer! Think of the other driver, and avoid problems. Defuse anger by an apologetic gesture or word. Others may be prone to road rage, but you do not need to imitate them. So taking a realistic view of both your own driving skills and those of other road users is vital to coping with road rage. Although others mistakes stare you in the face, do not overlook your own driving faults. Accept the fact that there are drivers who flout the rules of the road. Therefore, when you drive, make sure you are fully alert to prevent the negative consequences of road rage.